The talk itself had its highlights and low points. 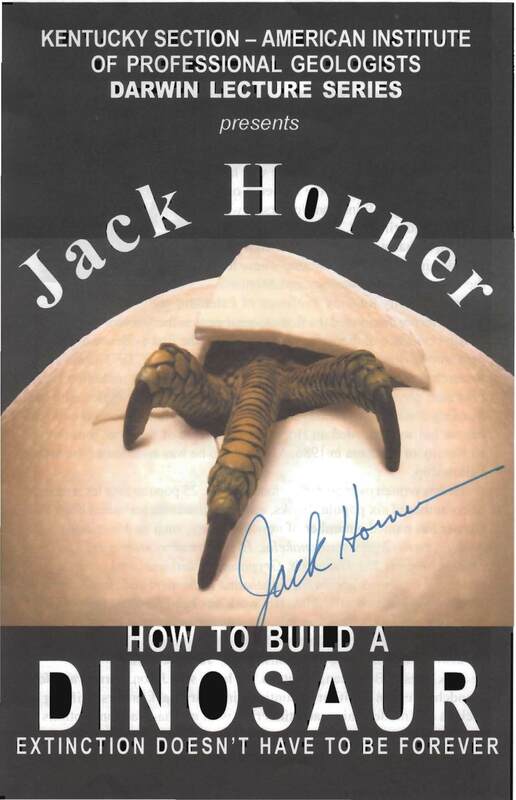 I found Horner’s discussion of his “dissection” of fossilized dinosaur bones to be riveting, and I think his mock “extinction” of dinosaur species (actually, the revision of the fossil record so as to recognize that many supposed species are probably just juvenile versions of the same species) was presented in a clever and accessible fashion. I’ll admit that this talk was a bit more special for me, since it gave me an excuse to spend some time with my older daughter, Heather. She’s back in the area, and was able to get back to Lexington to attend the talk (and actually be an usher for the event). A nice dinner at Banana Leaf and some back-and-forth about the subjects (Heather giving me some inside scoop from the perspective of an MSU grad student, and me panning the chickenosaurus schtick) made for a fun time. Among the conserved proteins of the polyadenylation complex, seen in all eukaryotes (including the highly-reduced polyadenylation complex in Giardia) is the enzyme that adds the poly(A) tail – polynucleotide adenylyltransferase or, more colloquially, poly(A) polymerase. One would think that the evolutionary history of such a core component of the gene expression machinery would be rather unremarkable – it should be present at the outset and pretty much conserved throughout evolutionary history. Of course, reality is much more interesting. A former student of mine did her thesis on Arabidopsis poly(A) polymerases, characterizing the four (4!) genes and the protein isoforms. A former postdoc in the lab had done some work in rice poly(A) polymerase genes, and found an equally interesting multiplicity of genes as well as some fascinating expression characteristics. This work has been recently published in PLoS ONE; as is my custom, this post is intended to point out the paper and invite (here or at the journal’s site for the paper) comment, discussion, and criticism.